Content Marketing is a balance. To be successful, content should appeal to your audience in a way that’s fresh and engaging. But, in order to reach your target audience, you need a strategy that is based on data. But what kind of data, you ask. The short answer is that it depends. It depends on your goals and your audience – what you are trying to do for your business and what your audience is looking for. SEMrush conducted a Twitter chat that asked industry folks how they use data in content marketing and it resulted in some great insights. Those are metrics that you can base the success of your campaign on after it is running, but what data can you use to create your strategy? First, let’s look at what the steps of a strong content marketing strategy are, then go back and talk about how to base your decisions on data during each step. So how do you put more data into the decisions you’re making in each step? This step consists of researching your audience to the point of knowing exactly what they are looking for online. Here you can use data to identify the most popular topics in your niche and even discover new ideas that could be great for writing about on your site. So, your ideas for content should always come back to this. What are your audience’s needs and goals, will your content address their current situation, and does it have empathy? One way to see your audience’s needs and goals are with keyword research. 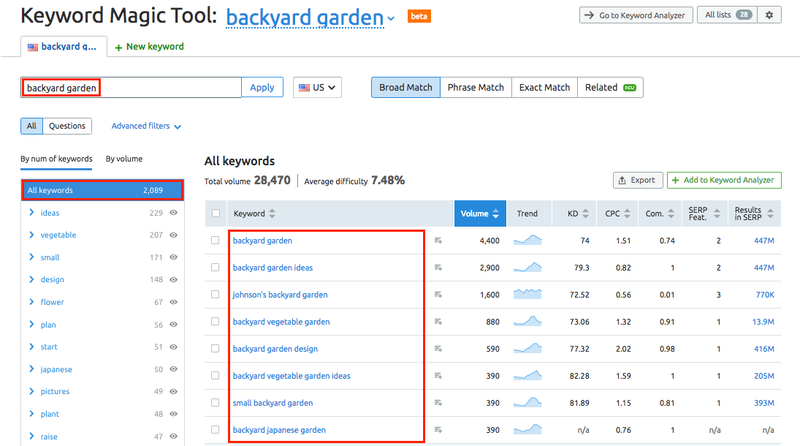 SEMrush has the perfect place to start: the Keyword Magic Tool. In this tool you can enter the main phrase and get a huge report with all of the most related search terms, broken down by volume, CPC, difficulty, and more. If you look to the left, the 2,089 keywords that this report generated are broken down into groups by their more specific subtopic. The list of keywords in the table will be chock full of ideas for content around this topic. 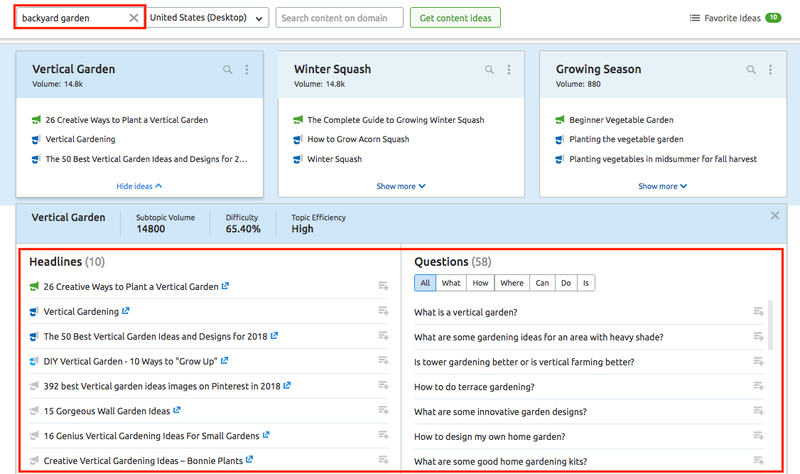 So you can click through the groups until you find the perfect subtopic with higher volume and lower difficulty to base part of your content strategy around. To go deeper into your audience’s needs and goals, you can specifically look for keywords that ask questions. This way, you can directly offer them an answer that you know they are looking for. 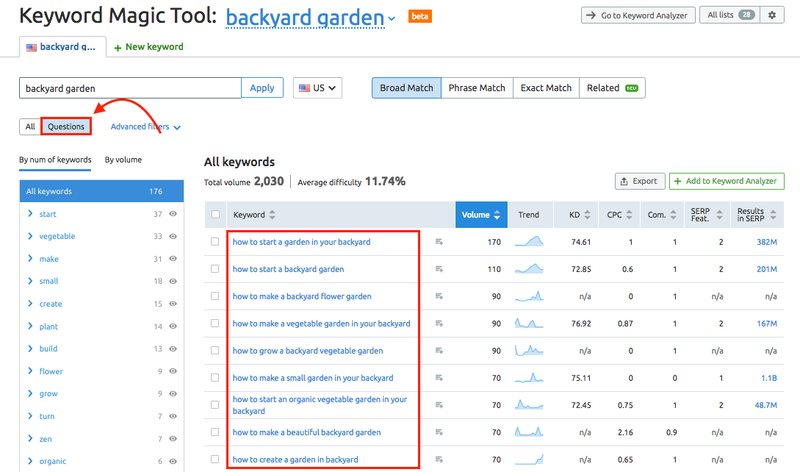 Questions can be found in SEMrush’s Keyword Magic Tool as well as the Topic Research tool. In Keyword Magic Tool, all you need to do is hit the questions filter to reveal only keywords that have “how, what, why, where, when, etc” in them. Again, you can click through the groups on the left to hone in on the perfect topic. This is what it looks like when you select a group to inspect. As you click on each group you’ll see the “Total volume” and “Average difficulty” above the table change. This data tells you how popular each topic is on search engines and how hard it would be for your campaign to break into the top of the results. The other great tool on SEMrush that helps with coming up with ideas called Topic Research. With this tool, you enter your seed keyword and SEMrush generates cards of subtopics based on the headlines of top-performing content that it finds ranking in search. Next to the headlines you’ll also see questions again. These are going to be another great source of ideas for your content strategy, as they’re based on Google’s related questions. This tool lets you save any ideas you find here to your “favorites” to keep track of all of your best ideas over time and let nothing slip through the cracks. Another easy way to gather ideas is by looking at a competitor’s success. If you want to find success on search, take a look at the Organic Pages report. This report is going to show you all of the top pages of a domain based on the number of keywords they rank for and the estimated traffic generated from those keywords. Enter a competitor’s domain and see the landing pages on their website that have the most success in search. You’ll see each page’s estimated traffic, the number of keywords, and backlinks. The higher these numbers, the more successful the page is and the more you can learn about what works in your niche. 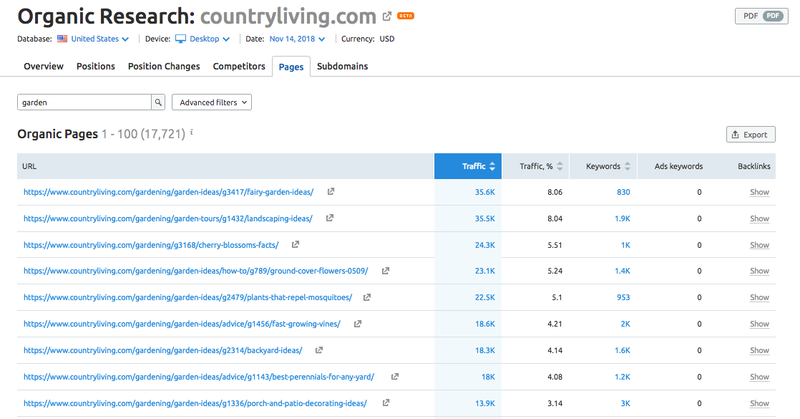 If the competitor is a large site you can even filter the report by a keyword in the URL. For example, add “garden” as a filter and see the following on countryliving.com’s Organic Pages report. All of the URLs in this list are great sources of ideas from your competitor’s website. So eventually the fun research part has to come to an end and it’s time to start creating and optimizing the content pieces your campaign will be based around. What are some ways to base your content creation on data? To start, you may be wondering how long your article or post should be. Or if it should include pictures, videos, or anything special in addition to just words. As for optimization, you might be wondering about the right page title, subheaders, or semantically keywords to include in your piece that will make it stand out to Google and gain traction. The simplest way to do this on SEMrush is the SEO Content Template. Enter the seed keyword of your topic, and the tool will give you back a template for content that will compete with what’s currently ranking on the first page of Google. The template includes your target word count, words to include in your title, and any semantically related keywords to include in the body or subheads of your piece. Following all of these suggestions can add up to make the difference that gets your content noticed by Google and subsequently more people. After you’ve created your SEO Content Template, you can paste your draft in the Real-time content check window, which grades your content piece’s loyalty to the recommendations as you write. You can download this feature as an add-on called SEO Writing Assistant that connects with Google Drive or WordPress and does the same analysis of your text but directly in a Google Doc or WordPress. It’s a super easy way to keep the focus on SEO as you write your blog posts, FAQs, or whatever types of content best address the findings of your research from step 1. When it comes time to distribute your content to reach a larger audience, you should refer back to the goals of your strategy for guidance. An analysis of the different channels will help you align the right channel with each goal from your strategy. Three of the most common ways of distribution are social media, email outreach and paid ads. If you’re going for traffic, then you’ll want to cast as wide of a net as possible – use a social media planner like Hootsuite or the SEMrush Social Media Poster to set up a series of posts and tweets and use UTM codes in your hyperlinks so that you can measure traffic from your posts in Google Analytics. Run a paid campaign and measure the total visits to your landing page. If you want to use email outreach, then you should use a link building platform like Pitchbox, Buzzsumo, or SEMrush’ Link Building Tool to help automate your outreach process. For finding opportunities for outreach, use a mentions tool like Google Mentions or Brand Monitoring on SEMrush to track the resources in your industry that mention your competitors. If there’s a blog or website that mentions a competing website of yours, you can reach out to them with your new content and ask if they would be interested in mentioning your site and adding a link to your content. Just be sure to give them a good reason for linking to your site when you reach out — let them know how valuable your content is (because it answers popular questions in your niche based on keyword research) and they will be more likely to give you a link knowing the value that the information will give their website visitors as well. The last step is all about looking at your content with a bird’s eye view and analyzing how well it’s performed so far and where you can make improvements. Position Tracking is the process of tracking the results of a set of target keywords on Google or another search engine. You’ll get to measure your website’s current standings for your target keywords and watch your site rise or fall over time as your content marketing campaign runs. Content Audit analyzes a subfolder of your website (choose your blog or relevant content subfolder) and creates a table of metrics to review data like page views, keywords, backlinks, and more all in one place. 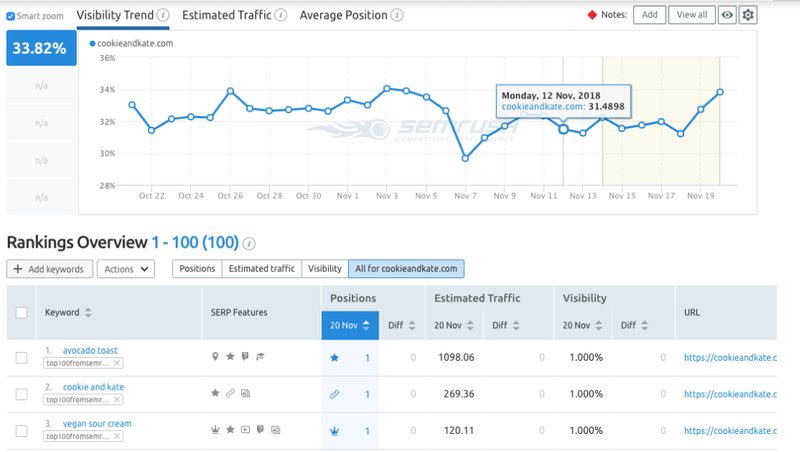 Just connect your Google Analytics to SEMrush to get data from GA like bounce rate and sessions in your table. While Content Audit helps you audit your on-site content, Post Tracking is a tool that lets you track the progression of your off-site content. Things like guest posts or content partnerships on other sites are usually impossible to track. But this tool helps you see the keywords, social shares, and backlinks that your off-site content has attracted – all measures of success in terms of engagement and traffic. For everything else – remember to use UTMs in your links to track the referral traffic and leads generated by content. For your emails, you can measure the open rate and click through rate to determine their impact. Data can be your secret weapon when it comes to content marketing success. The key to lasting success will always be learning from your mistakes and improving every day. By tracking the metrics with SEMrush discussed in this post, you’ll be set up for tons of insights and opportunities to hit all of your goals and dominate your niche with content marketing.